Psoriatic arthritis is a type of arthritis (inflammation of the joints) accompanied by inflammation of the skin (psoriasis). 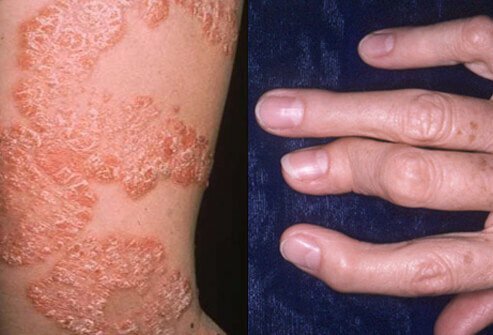 Psoriasis itself is a common skin condition characterized by scaly red and white patches on the skin. 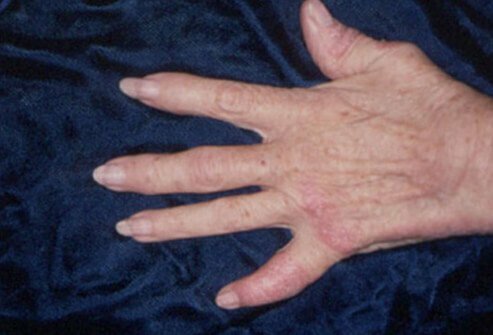 Psoriatic arthritis usually develops about 5 to 12 years after psoriasis begins. Who Is at Risk for Psoriatic Arthritis? About 15% of people with psoriasis will develop psoriatic arthritis. It is equally common in men and women, with most people diagnosed between the ages of 30 and 50. The exact cause of psoriatic arthritis is unknown, but it is believed to involve genetics, the environment, and a malfunction of the immune system. About 40% of people with psoriatic arthritis have a family member with psoriasis or arthritis, which suggests a hereditary link. The exact cause of psoriatic arthritis is unknown, but it is believed to involve genetics, the environment, and a malfunction of the immune system. 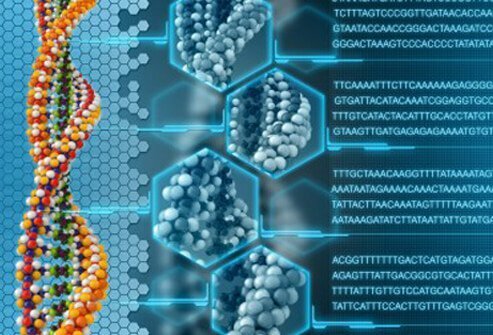 A genetic marker HLA-B27 is found in more than 50% of psoriatic arthritis patients with spinal inflammation. 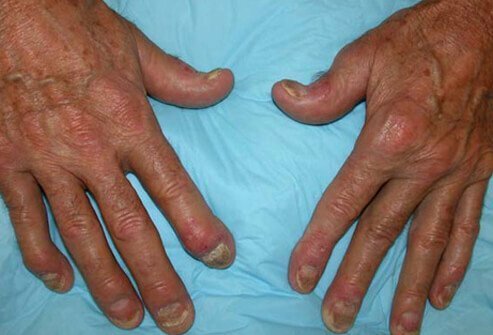 Other genes common in psoriatic arthritis patients have also been found. Stressors or changes in the immune system may affect the development or progression of the disease. Infectious agents and environmental factors are also being investigated as possible causes. What Are Psoriatic Arthritis Symptoms and Signs? Swollen fingers or toes that appear like "sausages"
People may also develop tendinitis (inflammation of the tendons), or costochondritis (inflammation of the chest wall and the cartilage that connects the ribs to the breastbone). Are There Different Types of Psoriatic Arthritis? There are five types of psoriatic arthritis, based on the parts of the body that are affected and also the severity of the inflammation. The type of psoriatic arthritis affects how it is treated. The following slides will review the five types. Symmetric psoriatic arthritis affects the same joints on both sides of the body, usually in symmetrical pairs, such as both knees or both wrists. It is considered similar to rheumatoid arthritis, and symptoms can range from mild to disabling. 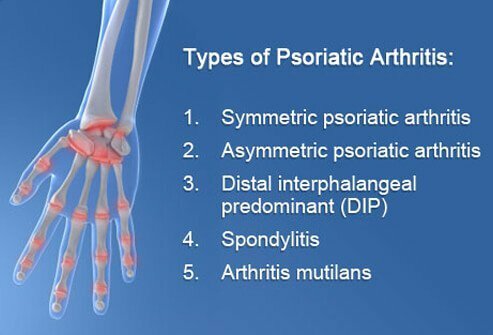 Asymmetric psoriatic arthritis can affect any joint, but usually not in symmetrical pairs on both sides of the body as in symmetric psoriatic arthritis. 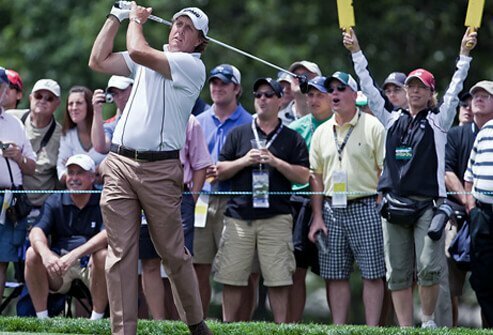 It often affects fingers and toes giving them a "sausage-like" appearance. It is usually mild, but can affect some people more severely. Distal interphalangeal predominant (DIP) psoriatic arthritis is often confused with osteoarthritis and it involves the distal joints in the fingers and toes (the small joints closest to the nail) and may result in changes to the nails. 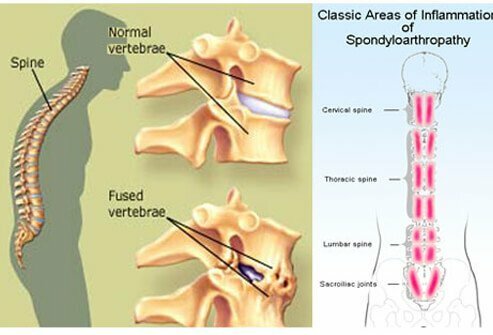 Spondylitis is inflammation of the spinal column and it may cause stiffness in the neck, lower back, spinal verebrae, or sacroiliac region (pelvic area). This can make moving around difficult. 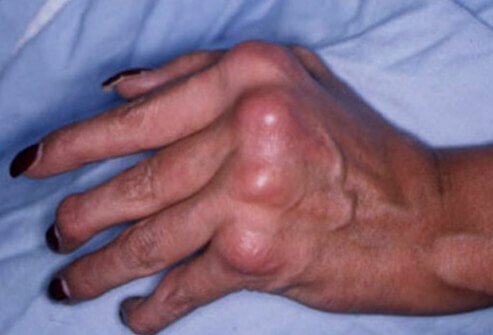 Arthritis mutilans is the least common form of psoriatic arthritis, but the most severe, causing degeneration and deformity. Usually the small joints in the fingers and toes closest to the nail are involved but it can also affect the neck and lower back. 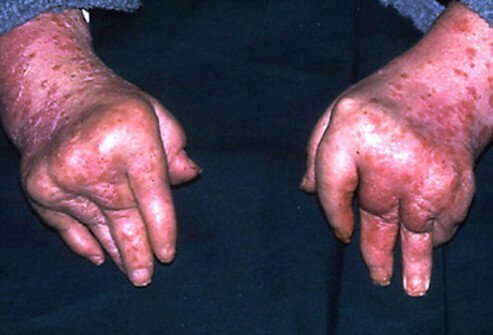 There is not one definitive test to diagnose psoriatic arthritis. It is usually diagnosed by a combination of clinical findings. 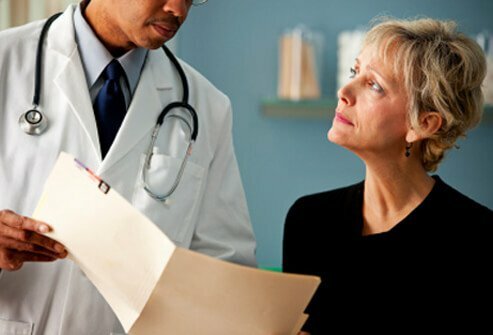 A doctor asks about your personal medical history and family history of psoriasis or psoriatic arthritis, and performs a physical examination of your joints. X-rays may be done to detect changes in cartilage or bone injury. 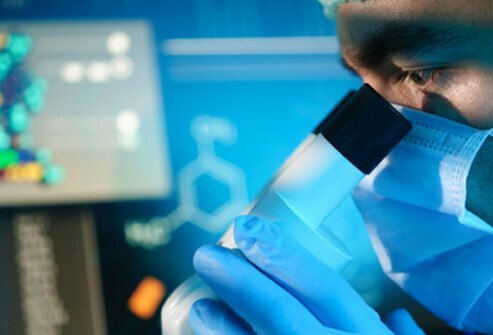 Blood tests may include sedimentation rate to detect inflammation, rheumatoid factor to exclude rheumatoid arthritis, and tests for the genetic marker HLA-B27, which is found in more than 50% of psoriatic arthritis patients with spinal inflammation. Arthrocentesis (draining fluid from a joint) may be performed. 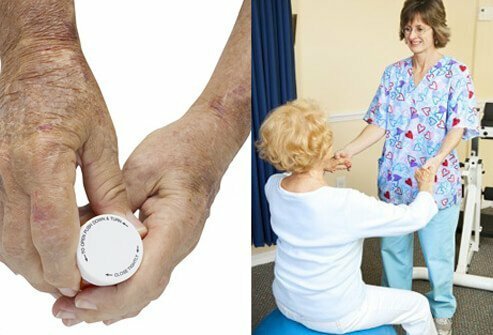 Treatment for psoriatic arthritis usually involves a combination of anti-inflammatory medications (NSAIDs) and regular exercise, either with a physical therapist or at home. Warm-up stretching or applying heat to muscles before exercise, and ice after exercise can decrease soreness in the joints. If NSAIDs are not sufficient, methotrexate (Rheumatrex, Trexall), corticosteroids, and antimalarial medications may be prescribed. Patients may need to use devices to protect the joints, and surgery may be indicated in some cases. Is There a Cure for Psoriatic Arthritis? There is currently no cure for psoriatic arthritis. Medications may be able to help with painful symptoms and slow or stop the progression of the disease. It is important as a patient to learn how your body responds to psoriatic arthritis, and how to use exercise, medications, and other treatments to manage symptoms. Vitamin D may help with the inflammation associated with psoriasis. 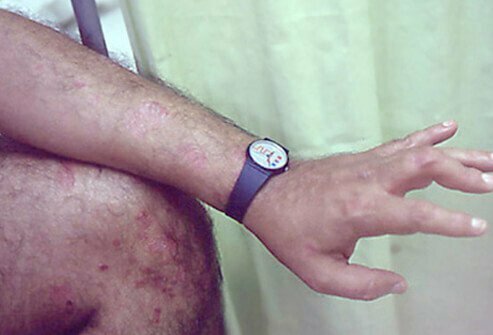 American Academy of Dermatology: "Psoriatic Arthritis." American College of Rheumatology: "Psoriatic Arthritis." National Center for Biotechnology Information, U.S. National Library of Medicine: "Risk factors and Predictors of Psoriatic Arthritis in Patients with Psoriasis*." National Psoriasis Foundation: "About Psoriatic Arthritis."